Featuring New 2K High-Def Transfer, All-New Cast and Crew Interviews, Feature-length Documentary, Music Videos and More! From acclaimed writer-director Walter Hill comes the stylish rock-and-roll fable, starring Michael Paré (The Virgin Suicides), Diane Lane (Man of Steel), Rick Moranis (Ghostbusters) and Amy Madigan (The Dark Half). Amid a brooding rock & roll landscape, the Bombers motorcycle gang, led by the vicious Raven Shaddock (Willem Dafoe), kidnap diva Ellen Aim (Diane Lane). Her hope for rescue lies with unlikely heroes: soldier of fortune Tom Cody (Michael Paré) and his sidekick, the two-fisted beer-guzzling McCoy (Amy Madigan). Joined by Ellen’s manager, Billy Fish (Rick Moranis), the trio plunges headfirst into a world of rain-splattered streets, hot cars, and deadly assassins. This cult favorite features a razor-sharp cast and original songs written by Jim Steinman, Stevie Nicks, Tom Petty and Ry Cooder and performed by The Blasters and The Fixx. 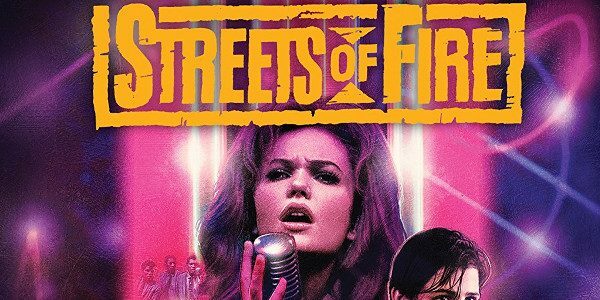 STREETS OF FIREis a rock & roll shotgun blast to the senses. *** Avid fans and collectors please take note: those who order STREETS OF FIRE Collector’s Edition 2-Disc Blu-ray directly from ShoutFactory.com and get it shipped two weeks early, plus receive a limited-edition 18″x24″ poster featuring our newly commissioned artwork! Available while supplies last.